Maintenance engineers are the unsung heroes of aviation. The global maintenance teams at CHC Helicopter work to one standard of excellence to keep the fleet in top condition. Safety and reliability are paramount considerations for any business, and nowhere more so than at CHC Helicopter. When you factor in the organisation’s size and complexity, its geographic spread around the world and the challenging conditions it operates in, the scale of that undertaking is enormous. That’s where the maintenance side of CHC Helicopter comes into its own. With multiple aircraft types and configurations in service for customers on six continents and every climate zone from the tropics to the Arctic, it has its hands full making sure its own exacting standards are met. Sean Toth is Director of Global Maintenance & Engineering. When he says his teams of technicians and support staff are there to ensure we provide the most safe and efficient operations to customers globally, he’s understating what a large endeavour this really is. Backing up the technicians is a 24/7 support centre in Dallas with an ‘aircraft on the ground’ (AOG) desk. As well as providing second-tier technical support, the centre is busy tracking and logging every incident to further our strategy of learning from experience. The variety of missions flown by our fleets has an impact on maintenance programmes, especially their planning. Oil and gas industry transport aircraft, for example, fly during the day, so they must be maintained at night. In other roles, such as search and rescue (SAR) and medevac, there isn’t that luxury. This variation extends to the rotorcraft flown by CHC Helicopter. Medium and heavy-lift types dominate the fleet with examples from Leonardo, Sikorsky, Airbus, and Bell, including the new Leonardo AW189 and the new H175 variant. CHC stays on top of the maintenance for such a broad range through rigorous training and as much fleet standardisation as possible. Maintenance is an important part of this approach. Jurisdictions around the world can have slightly different standards for aircraft maintenance, but we adhere to one standard – the highest – everywhere. “It’s important for our customers, many of whom have large global operations, to see the same standards of maintenance applied across the board,” says Sean. “We think it’s the right thing to do, and it enhances our service offering for our customers. “Our maintenance programmes and how we execute maintenance inspections are all the same as well. We base the programmes on the recommendations of the original equipment manufacturer (OEM) and tailor them to actual operations – high or low usage, for example – and operational environment. Around the world, CHC personnel working in maintenance use the same enterprise resource planning (ERP) system in the same way, giving us a powerful scheduling tool. “We standardise our long-term maintenance planning,” says Sean. “Typically we have a 18-24 month view of all our helicopters. It gives us better management of the supply chain, line of sight of parts and planning of the scheduled shop visits. An added benefit of having a common ERP system is that it becomes an important data collection and learning tool for us. And all that support helps operations and keeps our organisation focused. Advanced technology is making it possible to predict aircraft maintenance needs at a very early stage. In the helicopter world, CHC is at the forefront of development. We’ve worked with the OEM Leonardo and SKYTRAC, the data collection and management specialist, to introduce the ground-breaking Health and Usage Monitoring System (HUMS) on our fleet. Sean describes HUMS as “a slick system” that gathers and analyses information from vibration and temperature sensors fitted throughout the aircraft to give CHC’s engineers a complete picture of each helicopter’s performance while it’s working. “This allows us to monitor the helicopter in real time to make sure it’s operating at the optimal level,” he says. 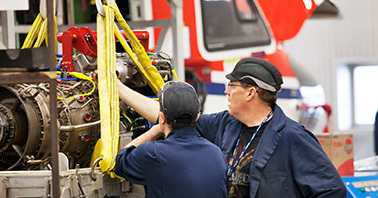 Making adjustments or replacing components early helps keep the helicopter safely in service for a longer time. Currently we’re rolling out SKYTRAC HUMS in our AW139 fleet. This modification incorporates satellite and ground station communications in the helicopter so it can transmit monitoring data to base in real time. “We gain in terms of efficiency by making sure our engineers are focused on proactive and productive tasks when the helicopter lands,” says Sean.